Photo poetry: A panel from Vishwajyoti Ghosh’s The Lost Ticket. Imagine a bunch of wide-eyed comic book artists from Switzerland learning how to play cricket and battling with water problems in India. And then, switch the scene to Indian artists lounging over football and beer while being quizzed on the romantic mechanics of Bollywood by their Swiss hosts. Sounds like fun? Slightly bizarre, too? 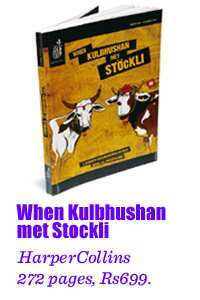 It’s exactly what the compilation of graphic short stories, When Kulbhushan met Stockli, documents. 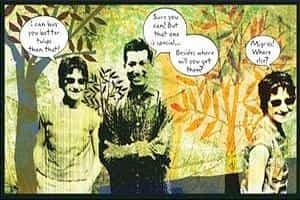 The comics collaboration was conceived in 2007 by the Delhi-based publishing house, Phantomville, Pro Helvetia, the Swiss Arts Council, and Swiss publishing house Edition Moderne. The book has 12 stories, six each by Indian and Swiss artists. The compilation is an experiment in telling short graphic tales which, individually and together, create a local universe. They follow widely different formats: Some, such as No Water in O Block by Kati Rickenbach and The Case of the Swiss Swan-foot by Samit Basu and Ashish Padlekar, are in the classic comic books style, while others such as The Yellow House by Orijit Sen have large chunks of text juxtaposed with illustrations. The participating artists had the luxury of a liberal brief. The only thing they were asked to avoid were time-worn travelogue-style notes of feeling lost or having diarrhoea, as editor Anindya Roy mentions in his introductory note. Most of the pieces by the Swiss artists, however, are unable to transcend the “Incredible India" flavour. The Mehandi Designers by Andreas Gefe and A Short Cut to India by Andrea Caprez and Christoph Schuler are at best naïve, illustrated Lonely Planet inserts. But Cricket etc by Christophe Badoux, who travelled outside Europe for the first time for this, stands out for its humour despite its predictable theme. The pieces by the Indian artists manage to go a little deeper. In The Lost Ticket by Vishwajyoti Ghosh, the graphic novelist explores issues of migration, family and love through a semi-fictional character called A.B. Sen. Ghosh uses memorabilia—old photos, postcards, stamps and ticket stubs—from the protagonist’s 1960s trip to Switzerland. He creates a lovely 30-page visual experience using several different styles of collage and illustration. On the surface, most of the stories are designed to elicit laughs, or at least a wry smile out of the reader. My Swiss Warm Up by Anindya Roy and Rajiv Eipe hilariously chronicles a young Indian man’s Swiss sojourns. Although it deals in clichés—football, Indian song and dance, spicy food—Roy manages to infuse his narrative with humour. The open format of the stories ensures that the graphic enthusiast has a variety to pick from. One piece doesn’t fit in, though: Charl and Otte by Pascale Mira Tschani is better suited for a psychedelic children’s compilation. Narratively, most of the others stick to the cultural exchange meta-narrative. The collection also conveys a distinct sense of bonhomie among the participating artists. For instance, while driving an autorickshaw around Delhi, Badoux answers a call from Vishwajyoti Ghosh, who invites him for a cricket match (the Indian artists did actually host cricket matches for their Swiss counterparts). If you feel voyeuristic, and want a peek into these artists’ graphic diaries, get your hands on the book.